Just posting this because I've gotten enough information that it'll be helpful to anyone who's wanting to do in-depth hacking of Mario Golf 64. I've decoded the compression used on both 3d models & surface mapping for levels, and found a resource table that lists all level data and other unknown goodies. Just look here if you're interested. 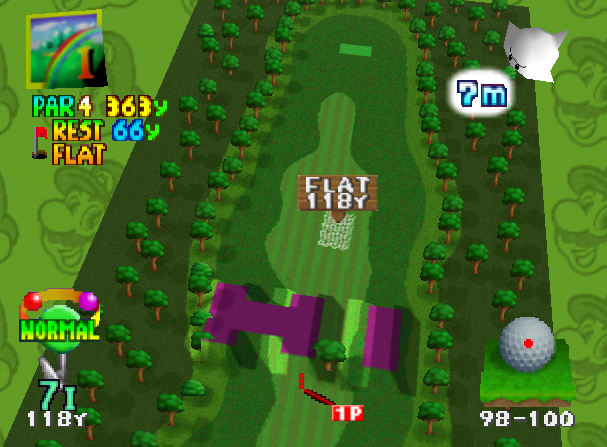 Also, if anyone has questions about the Mario Golf 64 rom, I can try to answer them here. That's nice! This should be on Mario Golf 64 Subforum! Huge thanks to Mib_f8sm9c for putting good effort for finding the TLB and heightmap! is there a way to view the models? Not yet. I have a janky model viewer I threw together, but it's not much more than a debugging tool. There's hierarchy information that details how the different parts of the model (head, body, arms, etc) are related to one another, plus a bunch of limb matrices to allow for animations on the models to work. Without figuring those out, the best I can do is render one body part at a time. (17-04-2017, 06:43 AM)mib_f8sm9c Wrote: Just posting this because I've gotten enough information that it'll be helpful to anyone who's wanting to do in-depth hacking of Mario Golf 64. I've decoded the compression used on both 3d models & surface mapping for levels, and found a resource table that lists all level data and other unknown goodies. Just look here if you're interested. Definitely interested! How are the course layouts stored in the rom? How difficult would it be to swap out a character? The wiki has more in-depth answers under the Resource Table section, but essentially there's a table which holds a bunch of information about the levels. Each level has 7 different data sets associated with it. The first two are encoded height map data (which I'm currently investigating), the third is the object list (so details where trees are stored), the next three are still unknown (possibly the location of the cup/player starting, and other goodies) and the last data set is compressed surface map data (so what areas are green, which are rough, etc). Right now the surface map and the object list would be very simple to make editors for, and due to the nature of the table, it might also be possible to easily tack on new level data at the end of the ROM. The height map is a bit difficult to decode, but it's fun so I'm actively interested in it. To sum it up, creating a course editor would seem to be very viable and rather straightforward. Though I don't have a clue how you'd edit level height data in any efficient way yet. EDIT: I should note that a course editor is not on my to-do list right now. I'm mostly investigating the format of MG64 data right now simply because it interests me and I'm procrastinating my work on Mario Kart 64 a bit. You may do so, as long as it is reasonable. Well, I'm going to take a break for a while since I've been neglecting Mario Kart, but I've left quite a few notes at the wiki. I've also gone and made a program that can export/import level data. If you want to try to play with it a bit, feel free to give it a shot. The really neat thing is that appending data works perfectly, which means that new levels, once the level data is all completely understood, will be incredibly easy to import. All the code for that is on my github too. Anyone who's interested is welcome to use that code as they please. Well, I can't quite leave this game alone. I pushed a bit further and figured out how to convert a 33x65 height map into the game. I really don't want to be kicking this bucket further down the street, but I can't seem to keep away from it. 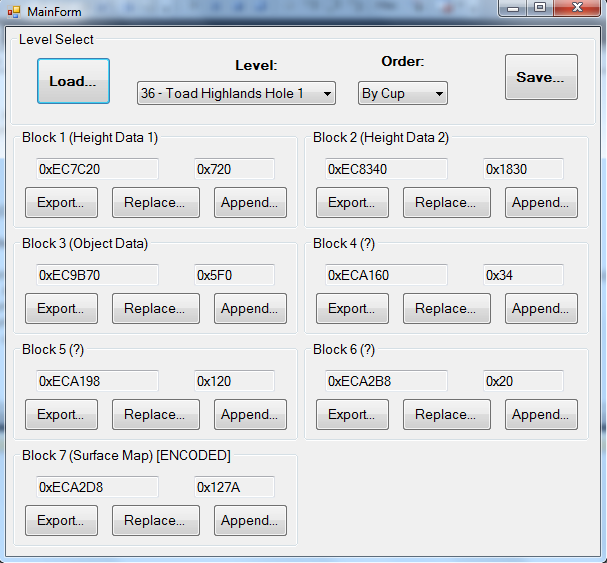 Between the height map, surface mapping and object list, there should be enough info to make a simple level-creator.